Exploring the idea of remembered landscapes, Brian Dickerson (American, b. 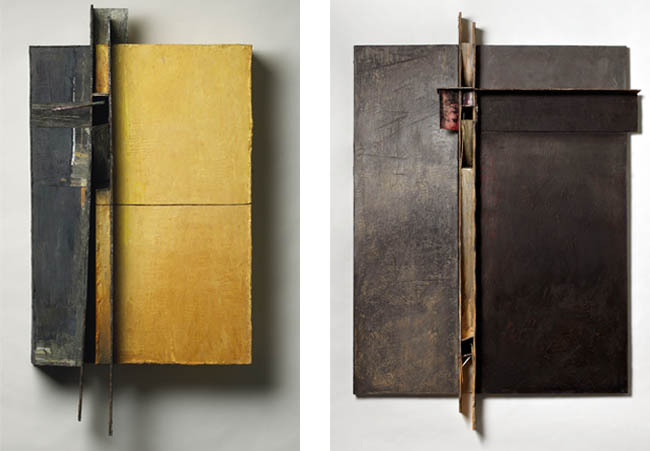 1951) creates painted wood constructions that are heavily layered and reworked. His works are a combination of painting and assemblage. His compositions are minimal, often containing an aperture to hidden forms and inaccessible places, resulting in works of great spiritual resonance. Evidence of gesture can be seen in the highly textured surfaces and the windows he creates, often from metal or wood, seem to suggest something beyond the surface. Although abstract, the titles of his paintings hint at places either remembered or unknown. American Art, the National Academy of Design, and the Woodmere Museum. In 2008 he was awarded a Ballinglen Foundation Fellowship, which resulted in travel to Ballycastle, Ireland in 2009, 2010, and 2011. Dickerson is a professor at the Art Institute of Philadelphia and Philadelphia University.